I would personally be a prime candidate for writing a book called, "The Joy of Doing Things in an Extremely Uptight Fashion While Striving for Unnecessary Perfection", but that wouldn't be a fun read, would it? I've almost never been able to relax and just enjoy what I do. When I started reading Veronica Chambers' "The Joy of Doing Things Badly" this morning, I honestly wasn't expecting much. The description at www.fictionwise.com made it sound a little fluffy, but it was half price so I figured I'd give it a try, maybe have a few giggles, and move on with my life. We think everything we do has to be up to snuff, and we forget that the pure, uncensored joy of living in our own skin comes when we are not attached, 24/7, to either our fans or our critics. It's on screen #44 of the 1209-screen book (remember, for me it's an eBook :), and it stopped me cold. Joy? I work hard. Most of the time. Although rarely 100% to my own standards. But even when I DO meet my standards, I tend not to find much joy in it because I always figure I could have done more. To take just one of the many examples I could give, last May I ran two half marathons, two weeks apart. The first was a lot of fun. (I do realize that for non-runners, 'fun' and 'half marathon' don't go together, but they do, trust me. :) The second was agonizing, and I nearly quit on several occasions. Here is a picture of me at the finish of the second race. Do I look happy? Compare me with the woman behind me. SHE looks happy, doesn't she? I look like I'm finishing a death march. Which is exactly how that race felt. 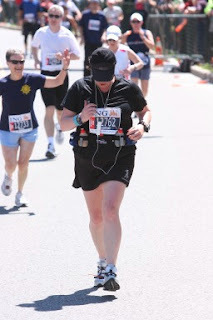 I was utterly exhausted and miserable and right at the edge of quitting for at least half the 13.1 miles. So what changed? For the first race, my first race of the year, I just wanted to have a comfortable race and feel like I'd done well, like I'd given a good solid effort. For the second, I decided (based on precisely nothing) that I had to be five minutes faster. The entire race, I was fighting myself to go faster than I could handle. And I had a terrible day. I think, I hope, that "The Joy of Doing Things Badly" will help me learn how to NOT do things like this to myself. I am a planner and goal-setter and I will always be one, and I'm fine with that. Everything I've done that I'm proud of has come as a result of my planning. But I also have to accept that a) not everything will go as I've planned and b) damn it, I have to have fun along the way. In the first draft of Aardvark, one character says to another, "Whether life is about the journey or the destination doesn't matter, because you don't seem to be enjoying either." We need to enjoy our lives, my friends. We really do. Do something this weekend (or next week if you don't see this until then, or next February if that's when it works for you) that you really enjoy. Just a little thing or a big huge thing. But do something. April 4, 2009 at 9:47 a.m. I enjoy finishing. Does that count? If I ran a race (which I never have because they are too painful to even watch, kind of like watching people screaming on a roller coaster) I would have your face, definitely. I would hate it. I would complain and try to talk myself out of it, constantly. But when I finished it, not that day or week, but maybe after a month, I would enjoy the telling of the day, and I would feel good. PS I'm a swimmer, 25-meter pool, and I go the extra lap just so I can tell someone about it, usually a sister. They smile and nod, probably not even listening, but the telling helps me do it again. April 8, 2009 at 5:43 p.m. I'm a swimmer too! I have an unfortunate tendency to ear infections, but I still swim whenever I can. I used to compete but the ear infections put an end to that. April 9, 2009 at 7:59 a.m.